The originator's files including flags applied have been archived by BODC and are available on request. Flag 2 is used by CEFAS for data that have failed the QA process because the data are below the accepted minimum for the parameter. As a result the cycles flagged in this way have been assigned BODC flag L (improbable value - originator's quality control). Flag 3 is used by CEFAS for data that have failed the QA process because the data are above the accepted maximum for the parameter. As a result the cycles flagged in this way have been assigned BODC flag L (improbable value - originator's quality control). Flag 9 is used by CEFAS for data that have failed the QA process because the data are deemed to be suspicious (unknown cause). As a result the cycles flagged in this way have been assigned BODC flag L (improbable value - originator's quality control). Flag 11 is used by CEFAS for data that have failed the QA process because the sensor platform was out of position. As a result the cycles flagged in this way have been assigned BODC flag L (improbable value - originator's quality control). Flag 12 is used by CEFAS for data that have failed the QA process because of a suspected sensor malfunction. As a result the cycles flagged in this way have been assigned BODC flag L (improbable value - originator's quality control). LB1_014_NA_1819 1194072 BODC has flagged some values as null (BODC flag N) as some of the data supplied by the originator with originator's flag 12 were < -1 µmol/ l or > 10,000 µmol/l. LB1_015_NA_2435 1194140 BODC has flagged some negative concentrations as suspect (BODC flag M). For one value where the concentration was < -1 µmol/ l the cycle has been made null (BODC flag N). LB1_024_NA_2435 1194846 The originator has applied flag 12 (below minimum for parameter) for the whole series. This flag has only previously been used for values below ~ 0.4 µmol/ l in similar series from the same instrument type. Please note that this document includes details of all of the parameters supplied by CEFAS at the time of submission, each series may contain only a subset of these parameter. This rig was due to be deployed on the earlier cruise PD11_05 but it was too rough for SmartBuoy operations so it was deployed as part of the Liverpool Bay Coastal Observatory during R.V. Prince Madog cruise PD12_05. The mooring also came adrift on 13 April 2005 and was on the surface for eight days before being put back into position by a CEFAS boat on 21 April 2005. The data in this period is unreliable and has been flagged. Recovery of the rig took place during R.V. Prince Madog cruise PD18_05. This rig is a SmartBuoy with a single line mooring, comprising a surface CEFAS SmartBuoy along with a Sea-Bird MicroCAT and an Aanderaa current meter attached at depth on the mooring line. The single point mooring was composed mainly of half inch long link chain, marked at the surface by a 1.8 m diameter toroid (the CEFAS SmartBuoy) and anchored by a half tonne clump of scrap chain. 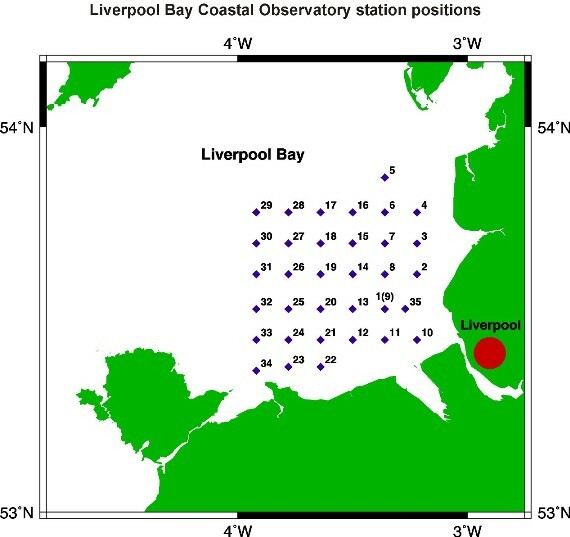 The CEFAS SmartBuoy was fitted with two surface CTDs, light sensors at 1 and 2 m below the surface, a water sampler which obtains water samples once per day for laboratory nutrient (nitrate, nitrite, phosphate) determination and an in situ NAS2E nutrient analyser. In addition a Druck 5 bar pressure transducer, a battery monitor and an analog roll / pitch device were attached to the buoy. The CTD and light data were transmitted back to CEFAS via Orbcomm. Conductivity 10 minutes Clock set at 18:09:00 on 4 April 2005. Delayed start 10:00:00 on 05 April 2005. Stopped at 22:11:00 on 11 May 2005. Clock is 9s fast. Sample number 5258. Conductivity 10 minutes No fin (low temperature setting) and conductivity: 10 minute samples. Started at 17:44:00 on 4 April 2005. Stopped at 01:21:30 on 12 May 2005. Clock 44 seconds slow.